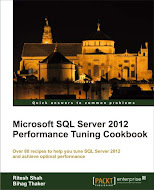 Well, I am not as qualified in SQL Server as the authors of this book (Pinal Dave & Vinod Kumar) though I dare to write my review for his book as both of the authors are in my favourite list and I don’t even miss any article written by them then how could I miss a book written by them? After reading the book, I really tempted to share my personal opinion with my blog reader. “SQL Server Interview Questions and Answer” makes first impression that this book is written to prepare you for the interview of DBA or SQL Developer or BI professional but NO, this book is not ONLY for those who are preparing for an interview, even seasoned developer or DBA could refer this book to master the basics which we may avoid or forget over the time but knowing those may create a firm ground for the project we all are working on. Both of these authors are well known to present hard & difficult concept in very simple yet powerful manner which directly execute INSERT command in your memory without any trigger or exception, just like strait thrown dart pinch in board, this really show very hard work of both authors. I really impressed with the book for following points. When I first heard about this book, I though how much more content could be there in this book? As Pinal has already written the series articles on this topic but with my surprise, there are LOT MORE to learn in book so even if you have read all articles on this series in Pinal’s blog, don’t hesitate to have this book, you will have so many (80%) new stuffs to look at. This book scores 10/10 and I personally highly recommend this book as a good & quick reference to any professional who are dealing with SQL Server at any level.